You can purchase the #HounslowGirl script through Aurora Metro Books HERE. Buy The Diary of Hounslow Girl audio recording on AUDIBLE. Ambreen Razia is a writer and actor from South London. The Diary of a Hounslow Girl is her debut play. 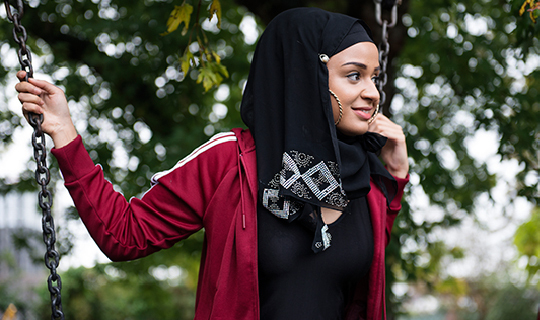 Ambreen recently featured in: Murdered by my Father (BBC Three) and No Guts, No Heart, No Glory (BBC 4 / Perth Festival Australia) and The Raz and Deep Show (The Wall of Comedy). You’ve heard of an Essex Girl or even a Chelsea Girl and now there is a Hounslow Girl, geared up and ready to take on the world. The Diary of a Hounslow Girl is told through the eyes of a 16 year old British Muslim teenager growing up in West London. From traditional Pakistani weddings to fights on the night bus this is a funny, bold, provocative play highlighting the challenges of being brought up as a young woman from a traditional Muslim family alongside the temptations and influences growing up in London. First there was Bridget Jones Diary, then Legally Blonde, but now there is The Diary of a Hounslow Girl geared up to take on the world. A comic story of dreams, aspirations and coming of age. Originally commissioned by Ovalhouse, London. Following Black Theatre Live's tours of Macbeth and She Called Me Mother in 2015, we are delighted to announce our next tour for 2016 with the astonishing new talent Ambreen Razia. Black Theatre Live is a pioneering national consortium of 8 regional theatres led by Tara Arts, committed to effecting change nationally for Black, Asian & Minority Ethnic touring theatre through a sustainable 3-year programme of national touring, structural support and audience development.